I know, I know. Nine days since I last posted a progress report here. I have not been completely idle in that time. I have been on a career exploration/hunting bent during this time. I am emailing my resume to headhunters, I am reading two terrific career-search books, the classic What Color is Your Parachute and a highly recommended The Pathfinder. And I had a free resume evaluation completed. I also continue to contact real estate agents to discuss the relative merits of homes in their area. 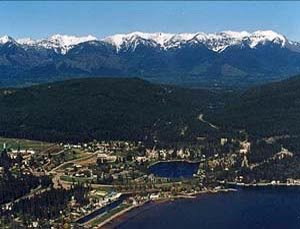 Most recently the Big Fork and Lakeside Montana areas, sitting on opposite sides of the Flathead Lake in northwest Montana. The cost of real estate is much more reasonable, however, the winters are very grey and the town's population drops from a summer-time high of 10,000 to 1,500, which doesn't sound great for the sense of community I was looking for. Yesterday I did some online research looking for feedback on what it would be like to be a single, non-Mormon, woman living in Utah. The results were mixed but overall not positive for career or dating prospects. Which gives me pause about Midway and Heber City, although I understand that Park City is much more liberal and diverse, though touristy. More than anything I have been suffering from a case of being blocked by fear. Apparently I am not alone. As I was skimming through Parachute (2008 edition) last night I came across an entire chapter devoted to why we get stuck and how to get unstuck. Bolles' sites brain research that suggests that we get stuck because our left, rational, brain wants to keep us safe and therefore sends us fear signals that fill our minds with doom and gloom messages that we are making the wrong decision and should stay put rather than embark on any new risky adventure. This message is in conflict with our right brain which is encouraging us to take risks and try new things to grow and enjoy life. When the conflict is strong enough we simply get stuck. Which is where I am right now....I am stuck and my chest feels full of fear of making the wrong decision and depressed at my inability to decide. One question keeps playing in the back of my mind: if money was no object, if you had only one place to choose, where would it be? The answer is of course: Lake Tahoe. And a friend actually said in that case, go, rent a house and see what happens. Leave it to the fates instead of finding another place grounded in more realistic housing prices? This is my Occam's razor, the horns of my dilemma. This is the question that has ground me to a halt and reduced me to a quivering, fearful mass of indecisive jelly. Go West, Suzanne, NOT north but west!